Clemson, SC – Chansi Stuckey was named first-team All-ACC for the second consecutive year, highlighting the selection of five Clemson players to the first-team all-conference squad announced Monday by the Atlantic Coast Sports Media Association. It marked the first time since 2000 that Clemson had five first-team selections. Stuckey was one of four Tigers on the first-team. The graduate from Warner Robbins, GA was joined on the first team by sophomore running back James Davis, senior offensive guard Nathan Bennett and junior offensive tackle Barry Richardson. Gaines Adams was a first-team selection at defensive end, Clemson’s only first or second-team selection on the defensive side of the ball. Clemson ranks 12th in the nation in total defense and 14th in scoring defense this year. Senior center Dustin Fry and freshman running back C.J. Spiller were both named to the second-team, while tight end Thomas Hunter and cornerback Duane Coleman were honorable mention selections. Clemson tied Wake Forest for the most overall first-team selections with five. Clemson, Georgia Tech and Virginia Tech all had seven first or second-team selections to tie for he most in the conference. The Tigers had four first-team selections on offense, two more than any other ACC team and the most first-team selections on offense for a Clemson tam since 1978 when Clemson had five. As far as the offensive line is concerned, this marked the first time since 1996 that Clemson had three first or second-team offensive linemen. Stuckey was named to the first-team for the second consecutive year, the first Clemson wide receiver named first-team All-ACC in two different seasons since Perry Tuttle in 1980-81. Stuckey missed three games with a broken foot, but finished the regular season with an average of five receptions per game, first in the conference. He has 45 catches overall for 607 yards and three touchdowns. He was second in the ACC in yards per game to Georgia Tech’s Calvin Johnson. 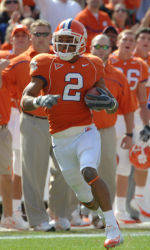 Davis was named first team All-ACC running back after he was named second team last season. Davis rushed for 1134 yards and 17 touchdowns this season. His touchdown total is first in the ACC and he tied a Clemson record for rushing touchdowns in a season. The 1134 rushing yards rank sixth best in Clemson history for a single season. He had 216 yards rushing in Clemson’s victory over 13th ranked Georgia Tech and was named National Offensive Player of the Week by the Walter Camp Foundation. Bennett and Richardson were keys to Clemson’s offensive line, a major reason Clemson leads the ACC in total offense for the first time since 1991 and leads the league in scoring offense for the first time since 1988. Bennett finished the regular season with a team best 97 knockdown blocks, while Richardson had 72.5. Bennett was named ACC Offensive Lineman of the Week for his performance against Georgia Tech. Richardson is the first Clemson underclassman offensive lineman to make first-team All-ACC since Jim Bundren in 1996. Adams led the ACC in sacks from his defensive end position and he ranks 10th in the nation in that category. The senior from Greenwood, SC has 10.5 sacks this season, tied for second best in Clemson history and his 26 career sacks rank third in school history behind the Perry brothers. Spiller, in making second-team All-ACC as a freshman, ranks fourth in the ACC in rushing with 76.2 yards per game, but he is coming off consecutive 150-yard rushing performances. He was a three-time ACC Rookie of the Week selection. He has a Clemson freshman record five 100-yard rushing games this year and has scored 12 total touchdowns, more than any other freshman in Clemson history. His 7.37 yards per carry figure is the best by any ACC running back since Warrick Dunn had a 7.5 average in 1995. Fry has started every game the last two years, and played more snaps than any other Clemson player on offense or defense this season. He has 68.5 knockdown blocks for the season and has been a major reason the Tigers rank fifth in the nation in rushing offense with an ACC best 225 yards per game.